False eyelashes are a ball ache at the best of times - you spend precious minutes trying to meticulously place them on your lids during your rigorous getting-ready routine only to rip them off without a care in the world come 3am. But if you thought the struggle of applying fake lashes was too much to bear in normal circumstances, spare a thought for this unfortunate lady who accidentally stuck a dead fly to her peeper in the ultimate beauty fail. There's a special level of respect I have for girls who are able to flawlessly apply individual fake lashes without having a meltdown - two attempts at sticking pre-glued full ones in place and I'm out. And while they have a reputation for getting stuck in every nook and cranny of your bedroom, just be grateful you've never mistook dead flies for lush lashes. That was the horrifying reality for a Twitter user's mum who publicised the experience on social media like any self-respecting millennial. 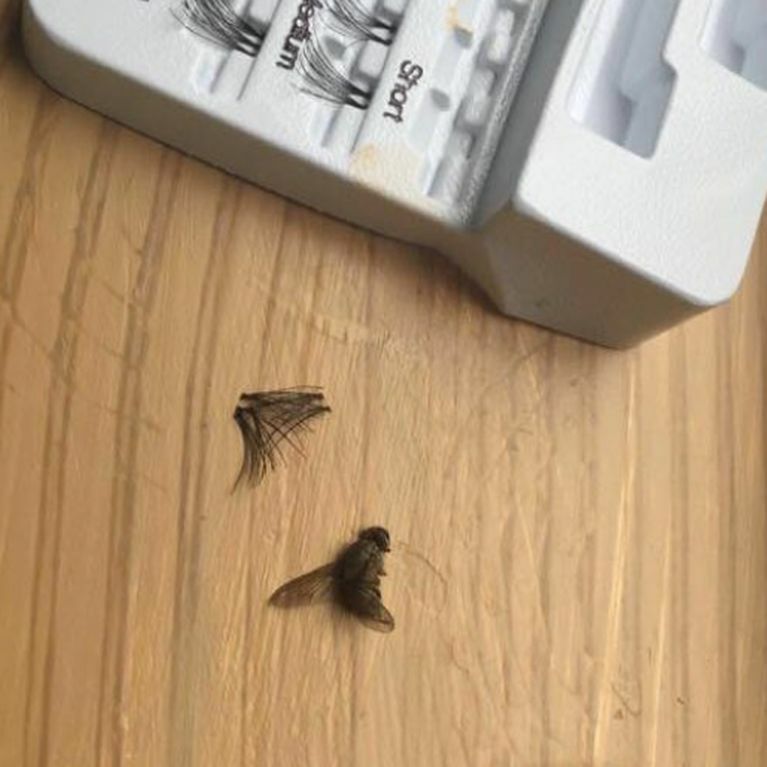 Molly shared a photo of a dead fly next to an individual eyelash extension, writing: "Text from mum - having trouble sticking lashes on without her glasses.. turns out she was trying to glue a dead fly to her eyelid. I'm out." Unsurprisingly, the internet was shook with over 20,000 people retweeting the original tweet and many expressing their horror. One wrote: "I died laughing imagine!!!" while another added, simply: "HAHAHAHHAHAHAHAHAHAHAHHAHAHAHAHHAAHAHAHHAHAHAHAHHAHAHAHHAHAHAHHAHA." How To Make Your Eyelashes Longer (And Lovelier)! Beauty buy: Jorgie Porter's fave fake tan!